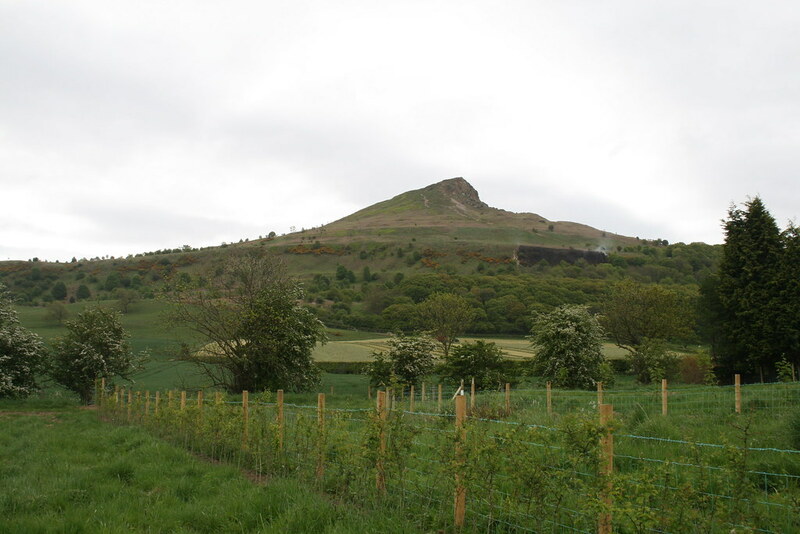 Roseberry Topping is sometimes known as The Yorkshire Matterhorn! Well, if you squint enough from the right angle, there is a sort of resemblance. It reaches the mighty height of 320m (1,050ft). 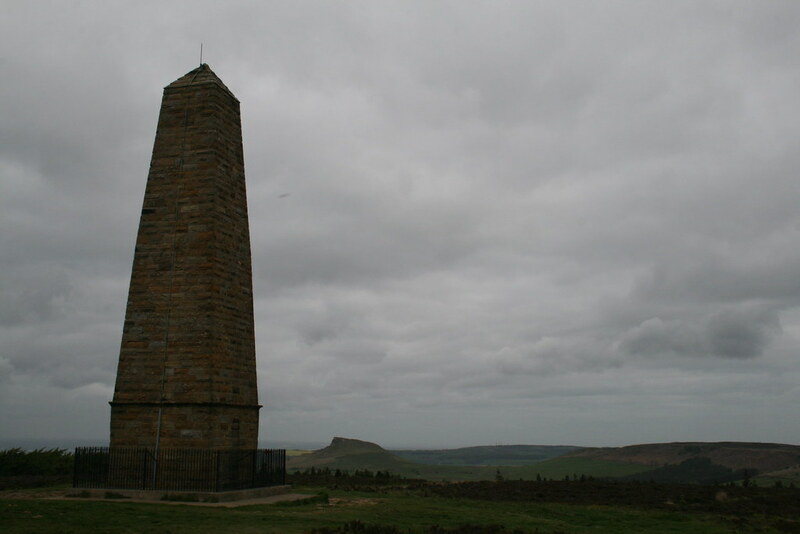 Nonetheless it is prominent from afar, detached as it is from the main bulk of the North Yorks Moors. One side of the hill collapsed in 1912 giving it its unusual shape. 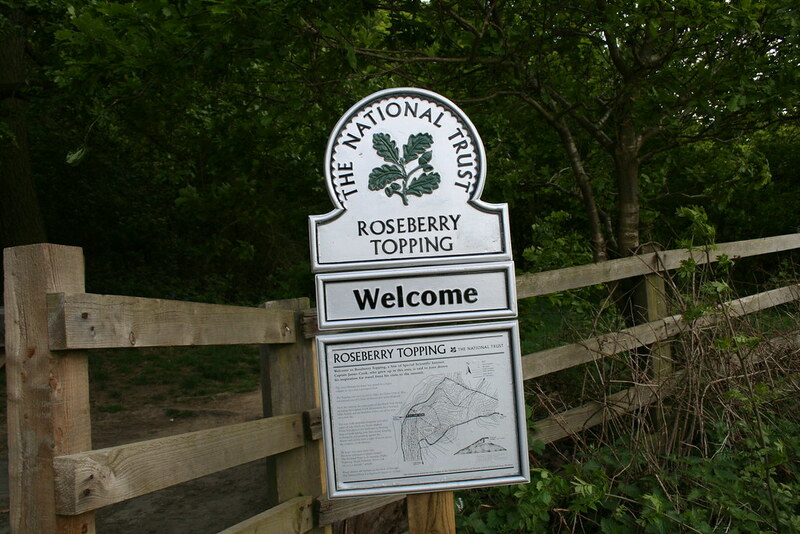 I climbed it from Newton under Roseberry and was on the top within 40 minutes. There is a clear path all of the way. Unfortunately, the views were obscured by low cloud and the threat of passing showers. 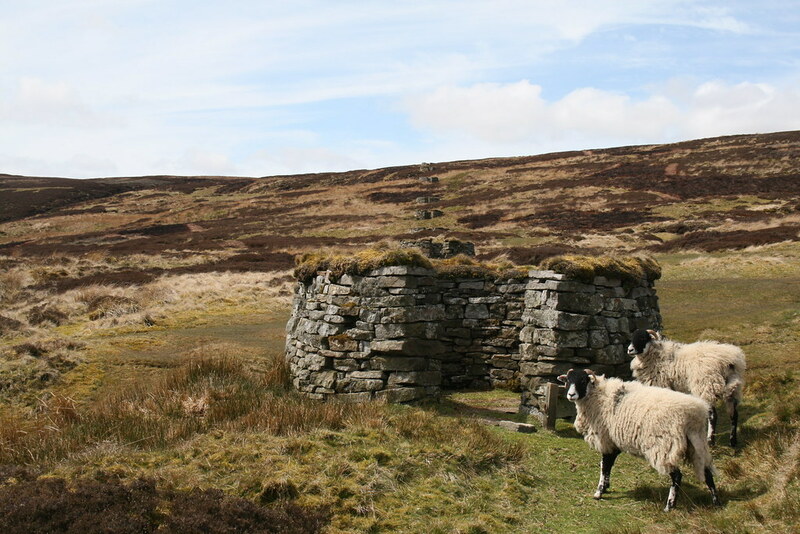 Normally there are great views across the Cleveland plain to the Pennines 40 miles away, to Captain Cook’s Monument on Easby Moor and around the northern escarpment of the North York Moors to Gisborough Moor. Oh and to the chemical plants around Middlesbrough. But it was all hazy today, and quite breezy. That meant that it was just me, Jet and two guys on the top which I reached before 9am, but I passed quite a few people on the way down. 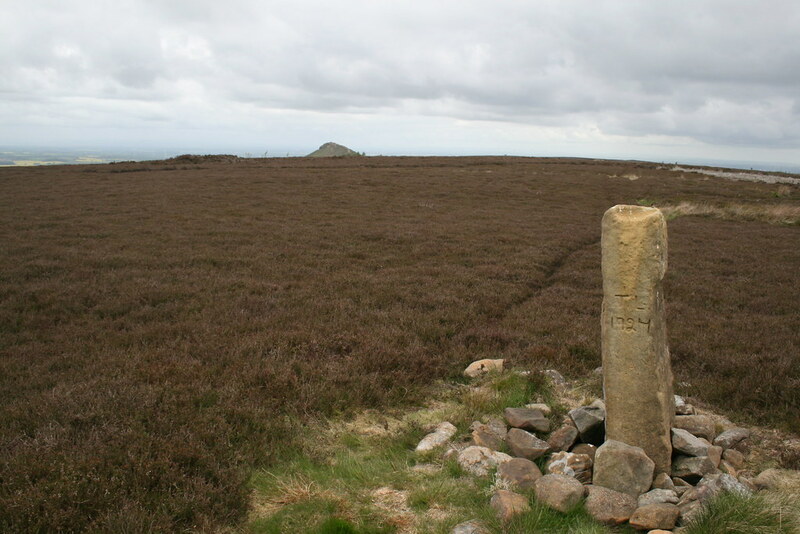 I then drove around through Great Ayton to the highpoint on the road between Easby Moor and Great Ayton Moor. 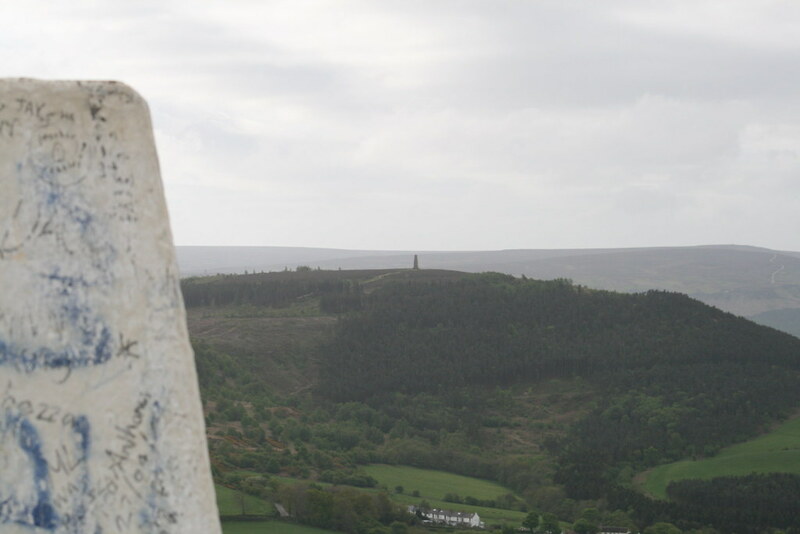 From here I would first go up to Captain Cook’s Monument on Easby Moor and then do a circular walk over Great Ayton Moor and around to Gisborough Moor. 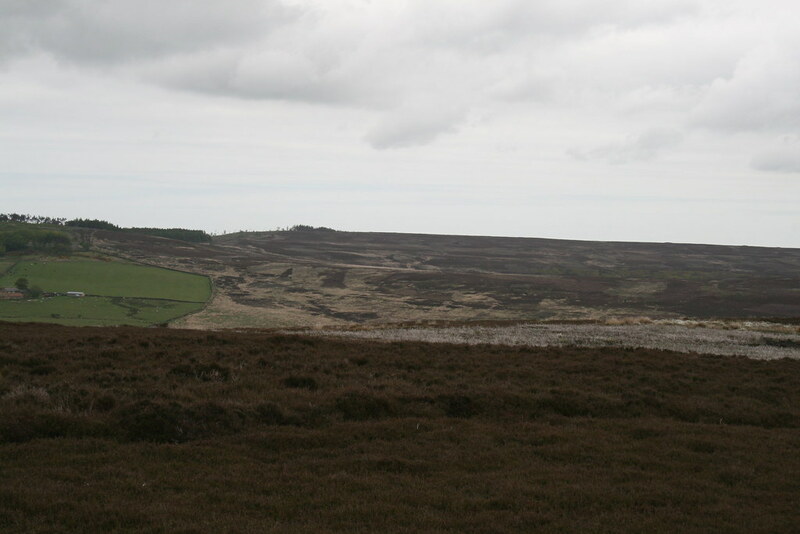 Gisborough Moor would be my final Marilyn on the North Yorks Moors at 328m (1,076ft). There was a wide path up to the Monument and a few cyclists on mountain bikes whizzed by. Then it was back down past the car and up on to Great Ayton Moor. Jet went on the lead because this is a grouse moor. 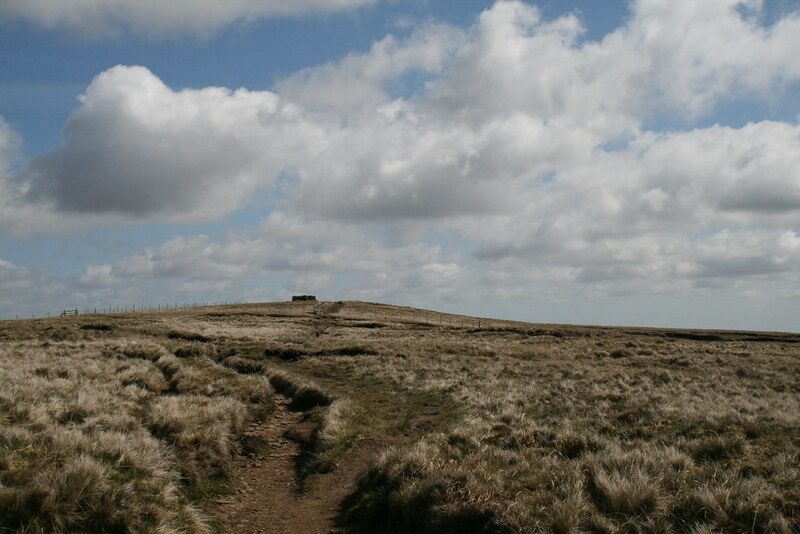 The summit was a line of ancient cairns off the public footpath but on access land. 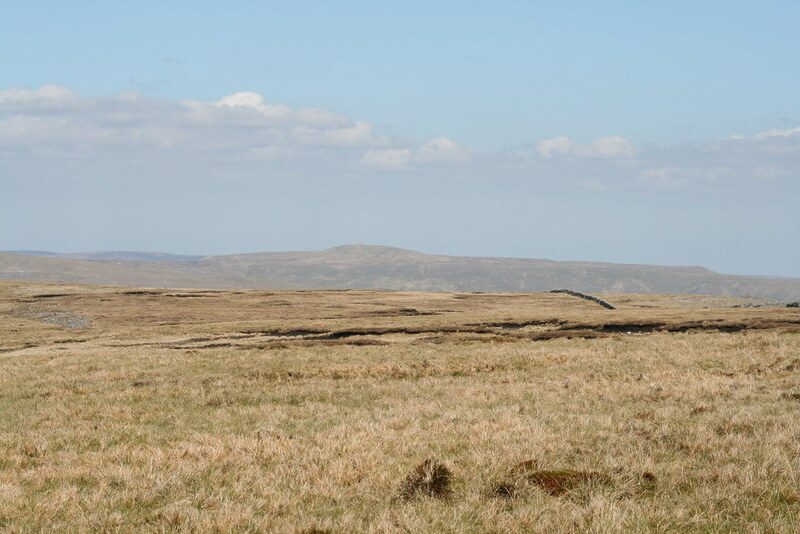 The views remained expansive, if hazy and over broad moorland. We dipped down through the heather to the Cleveland Way and I was able to let Jet off the lead. The ground descended gradually towards Highcliffe Farm and then followed the outside of the woodland for a further kilometre to the trig point at point 324m. 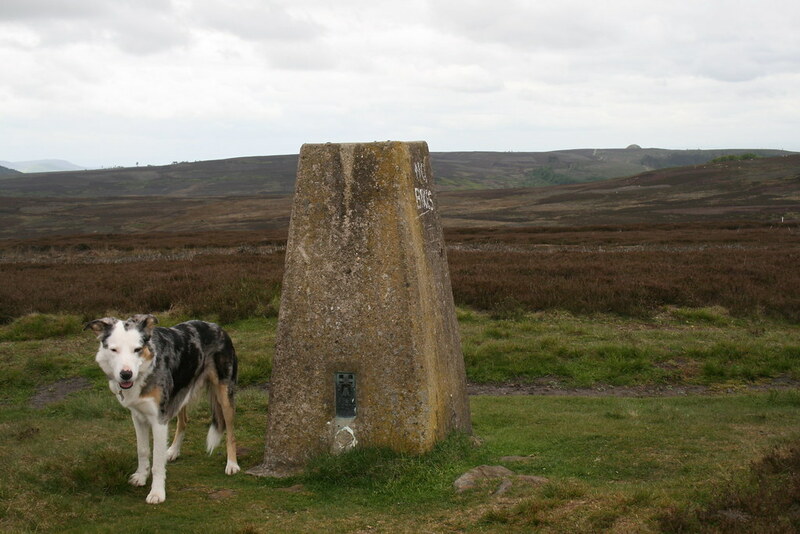 The trig point is not the highest point on Gisborough Moor. This is a further 2 kilometres to the south east and just 4 metres higher. 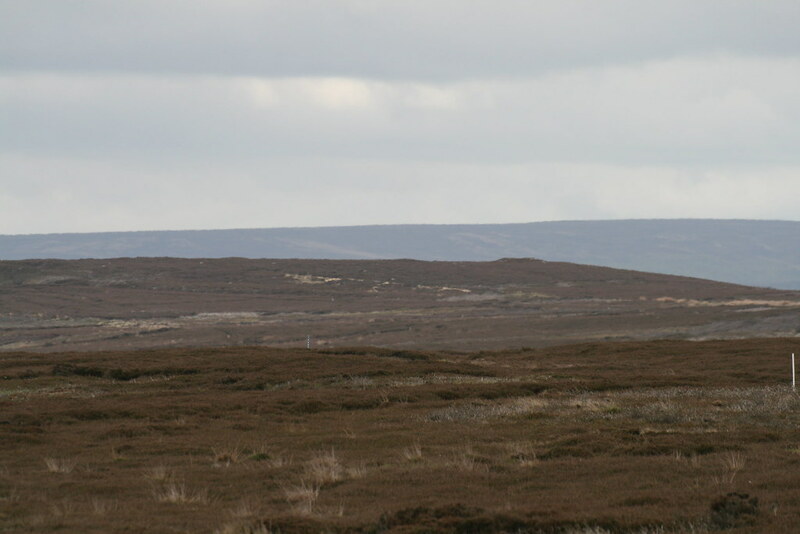 Way in the distance, to the south east, I could just make out the buildings at Fylingdales, the RAF tracking station. Now off the right of way I put Jet on the lead again. There is a track almost all the way and in the distance I could see a vehicle, and a figure. When Jet and I got there, I discovered it was the Estate gamekeeper. He was spraying the track edges against the possibility of thistle seeds. We had a chat about the fact that until around 10 years ago this stretch of moor was infested with bracken. The Estate had used helicopters to spray the moor and then undertaken selective spraying by hand over 5 years. 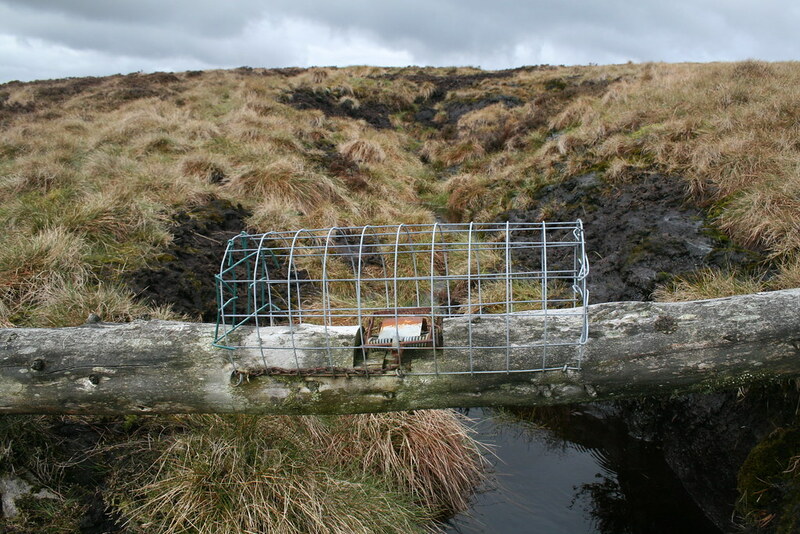 This had rid the moor of the bracken and grouse numbers had increased. The top was now not far off. 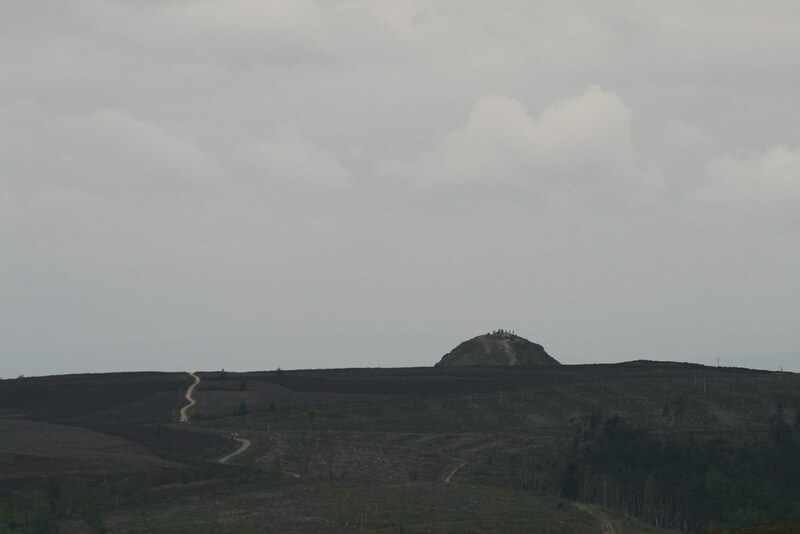 In fact there are three candidates for the highpoint, two of which are ancient tumuli and one a pile of stones. We visited each. From there, we followed a path down towards the farm at Sleddale and thence across the valley to the bridleway. This led to the minor road and a fenced off area where there is a hut circle at point 263. From there it was an easy walk around the side of Great Ayton Moor on the public footpath back to the car. An interesting day of wide open spaces and long distance views. An hour later I was back home. Today’s trip comprised naked list ticking. Two “Marilyns” neither having previously encountered the soles of my feet – with a morning walk and an afternoon walk. What is a Marilyn I might sense some say? Well it is any hill in the British Isles with a prominence of at least 150m (approx. 500ft). In other words, in order to reach any higher hill, you have to descend at least 150m to reach that higher hill whichever way you choose to go. Now that is explained, on to Great Shunner Fell or, as my spell checker insists on calling it, Great Stunner Fell. For the Yorkshire Dales, it is in fact a bit of a stunner. It is 716m (2,349ft) with a prominence of almost 300m. 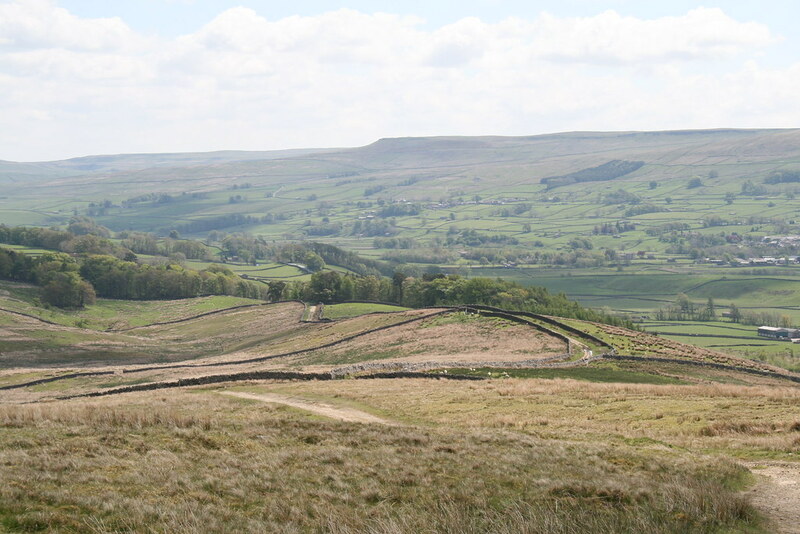 So it has fine views all around and, unusually for a Dales hill is a bit “pointy”. 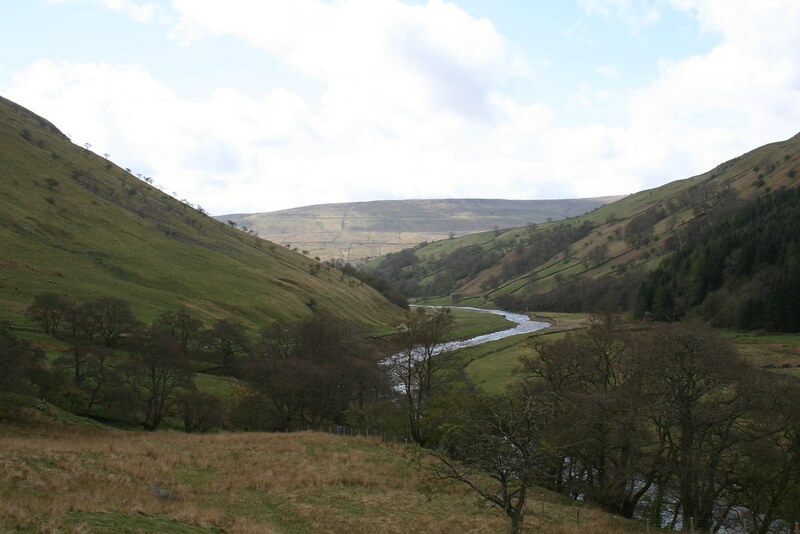 It lies between Wensleydale to the south and Swaledale to the north. 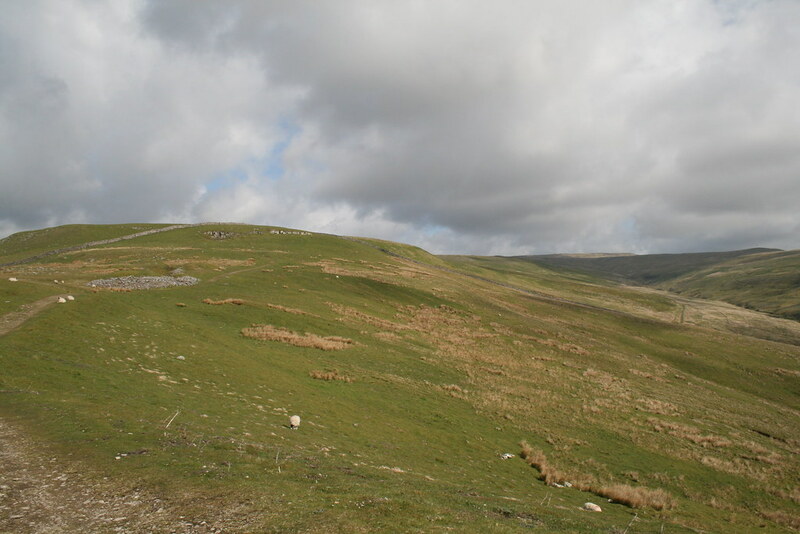 To its east is a road over Buttertubs Pass, most recently famous as being one of the climbs used by the Tour de France when Le Grand Depart occurred in Yorkshire last year. 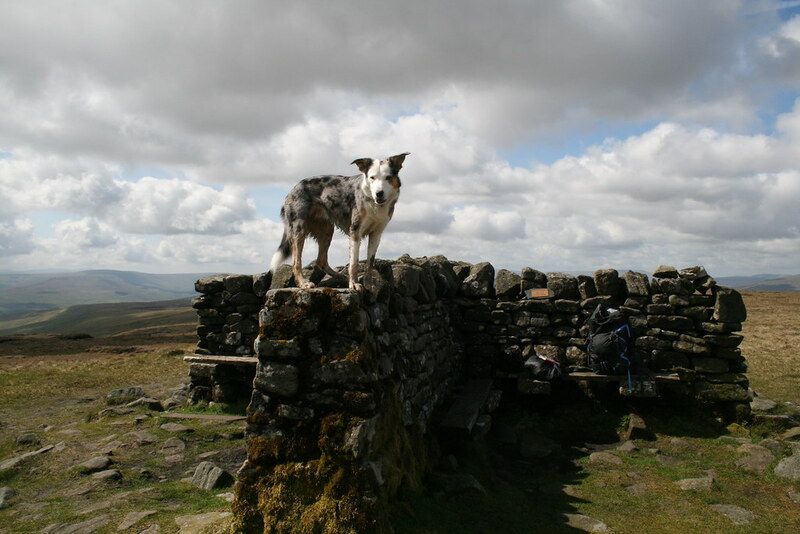 Jet and I were going to follow the Pennine Way from Hardraw to the south. This is not the shortest or quickest route up but is probably the most aesthetically pleasing. Parking can be found by the side of the road at the western exit to the village and the route then immediately follows a lovely enclosed bridleway that rushes you up to 330m. Here the path (which is still a bridleway) emerges onto broad open ground and a sign that informs you that the largest (heather and Black Grouse) regeneration project in the country is going on. A little beyond there a finger post points the way. From there the path ceases to be suitable for vehicles but the gradient eases. You are now on to typical Dales’ moorland. 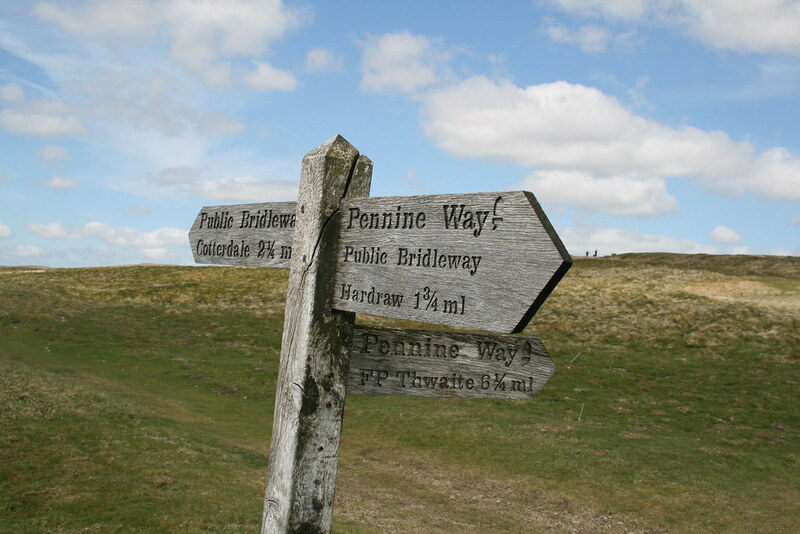 Being the Pennine Way, the way on is obvious. Indeed the weight of feet necessitates some protective action. Unfortunately the flagstones are necessary, but they do take away some of the feeling of remoteness. They are discontinuous but they are present much of the way to the summit. As ever Jet was keen to find whatever water he could. It is about 4 miles to the summit. We had been up and out early so did not see anyone else on the ascent. We had the top to ourselves. It was a little after 9.30am. Here are some summit pics. 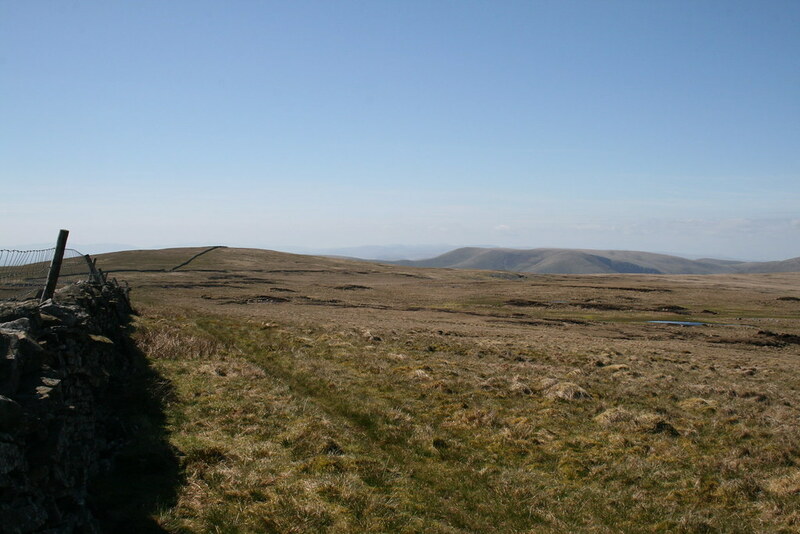 We returned the same way, though with a slight diversion to one of the beacons that fringe the hill. This one looked down into lonely Cotterdale. The OS map shows at least 8 of them. After a brief sit down there, we returned back down to the walled bridleway and quickly on to the car. So on to Baugh Fell. 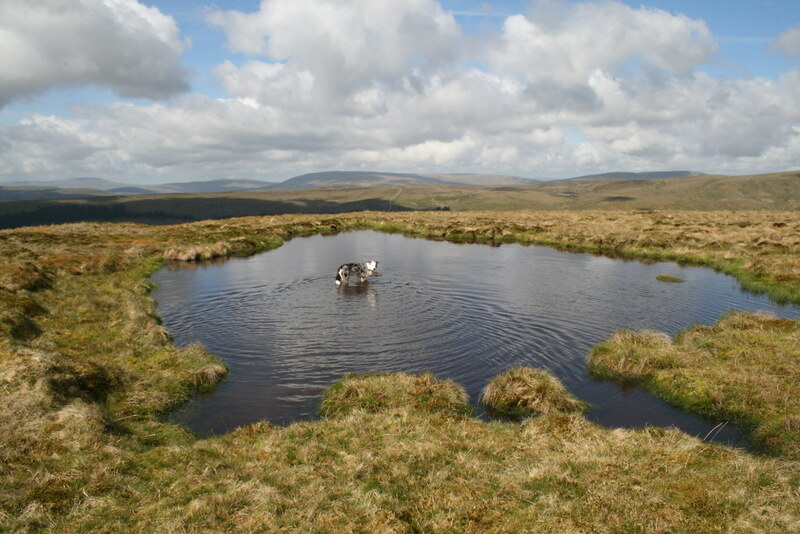 Looked at on the OS map, this hill does not look all that appealing – a big wet looking plateau. 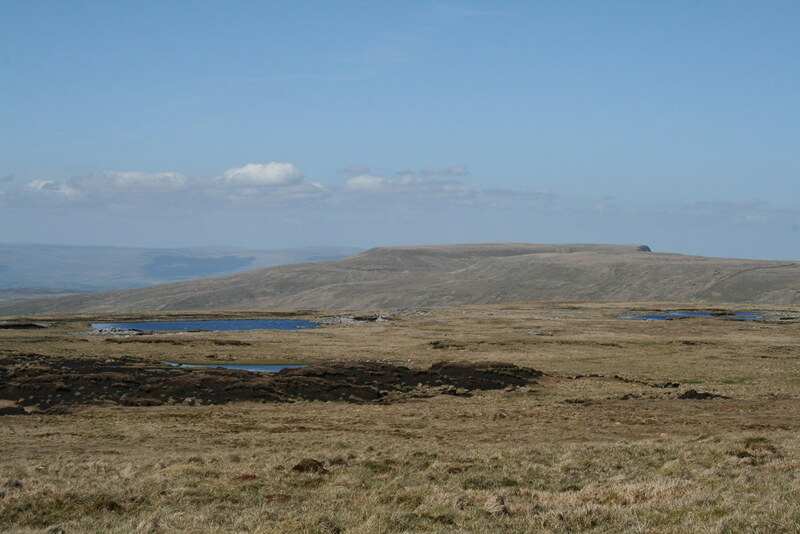 Pathless and surrounded by miles of tussocky moorland. I chose to approach it from near Grisedale to the east. There was a parking spot near a highpoint in the minor road. We left the car and dropped down to the stream crossing under the road which (when followed) would provide a useful feature to follow up to the heights. To start the way was very rough, and wet. As the slope increased, it became easier under foot and less wet. As the plateau was reached the first of the tarns that dot the upper reaches of the hill was reached. Before then a set of scruffy cairns on Grisedale Pike was passed. 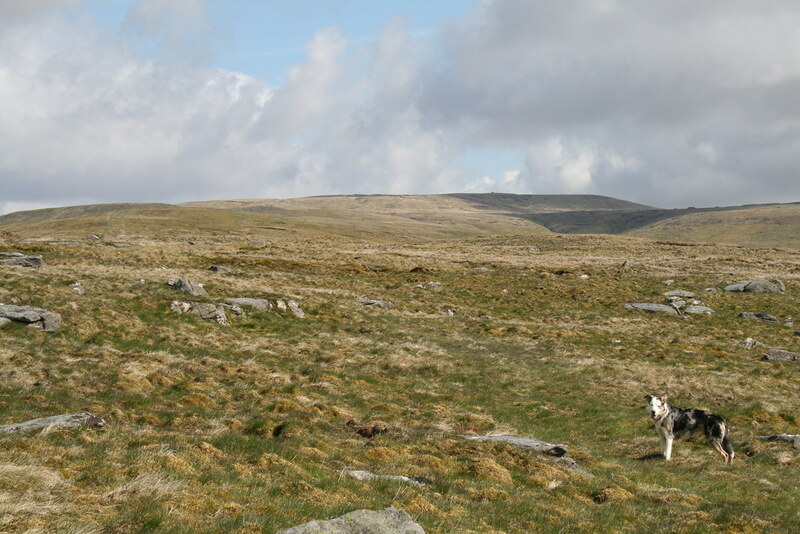 The eastern part of the hill is called Tarn Hill. The tarn itself was bright blue, reflecting the sky. The ground around it was very marshy. Water seeped over my boots. Jet was determined to have a swim, so he did! Shortly beyond there my route converged with a wall that I had been following 150m to my left. I then walked by the wall in a south westerly direction. The top is not market by any feature. The wall has a kink in it before it continues west towards the west top a kilometre or so away. 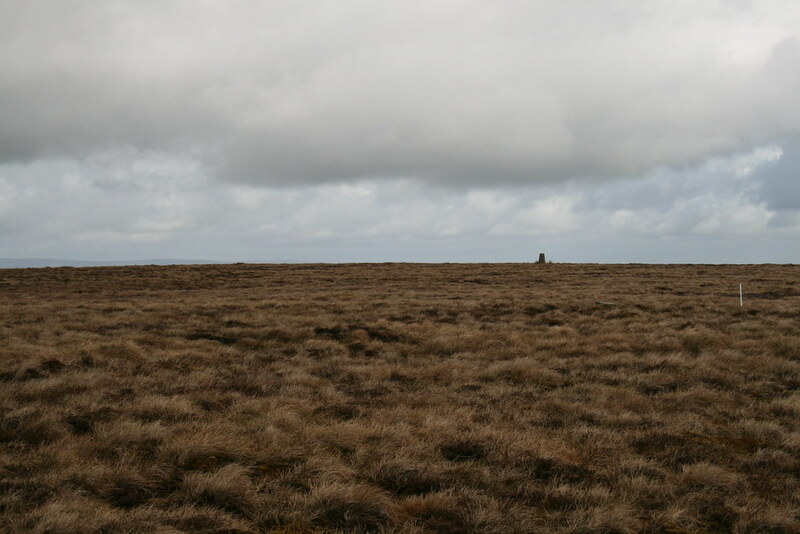 The west top has a trig point in it but is 2 metres lower. 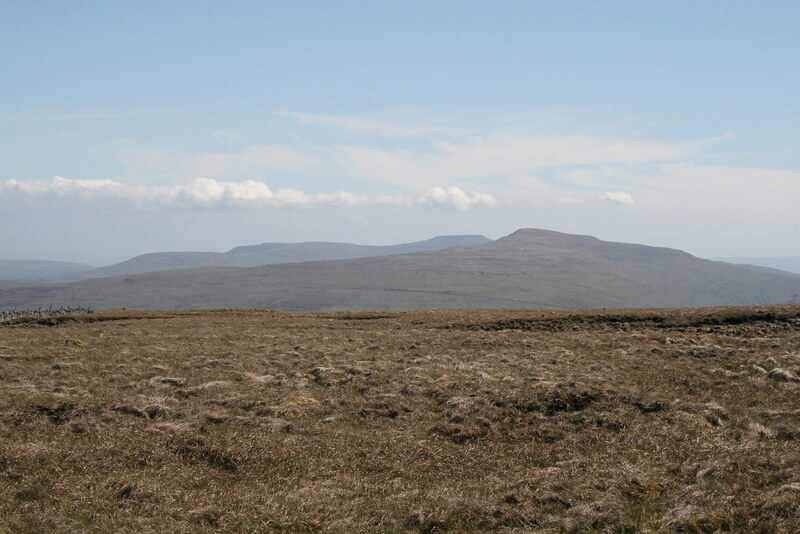 It is said to have the better view, but those views from the higher top were expansive – especially to Wild Boar Fell to the north (with more blue tarns peppering the middle distance) and the Yorkshire Three Peaks to the south. Great Shunner Fell stood out to the east. 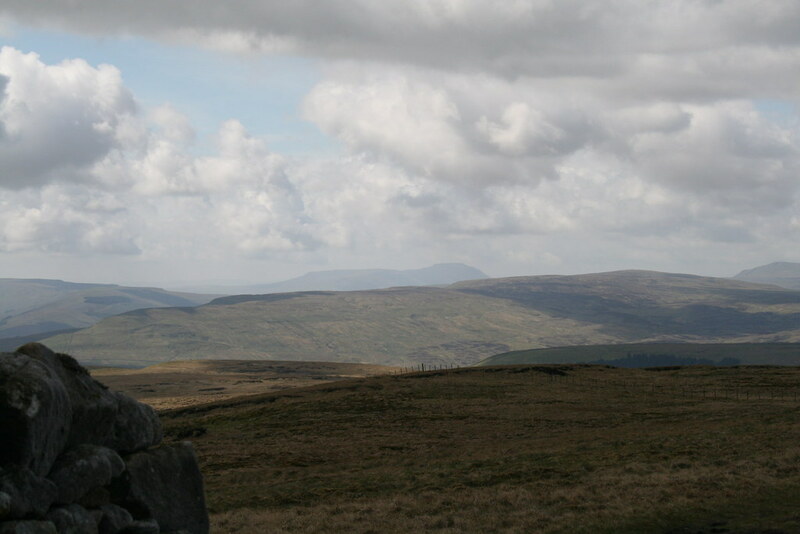 I could see the cairns on the rim of Wild Boar Fell where I had been just a couple of weeks before. Whilst this hill is hardly the most shapely, it has the feel of space and distant views, fairly typical of parts of the Yorkshire Dales. An ascent from the north-west might see more features and be a little more challenging. 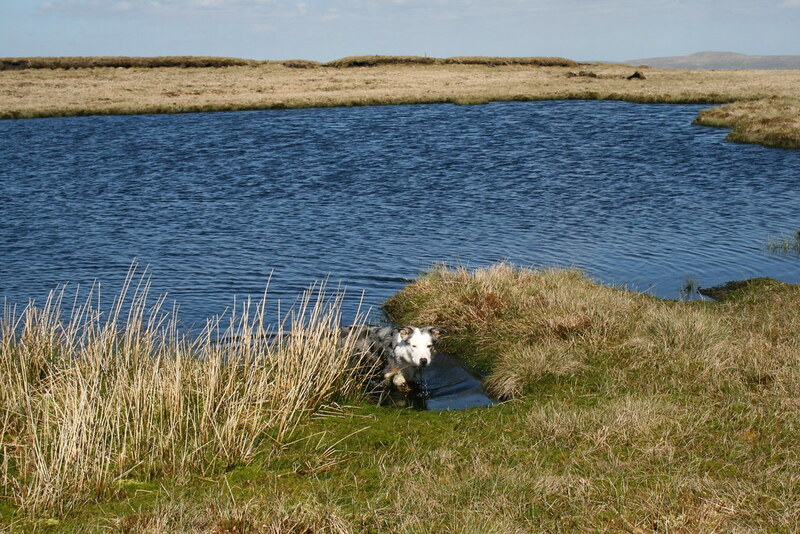 But on this day of blue skies and blue tarns, I was content with my outing. From Hazelgill Farm up the bridleway under the railway line and up towards High Dolphinsty. I had Jet with me today but we saw no boar. There were lots of sheep and so I kept Jet on the lead as we went through the land by the farm. 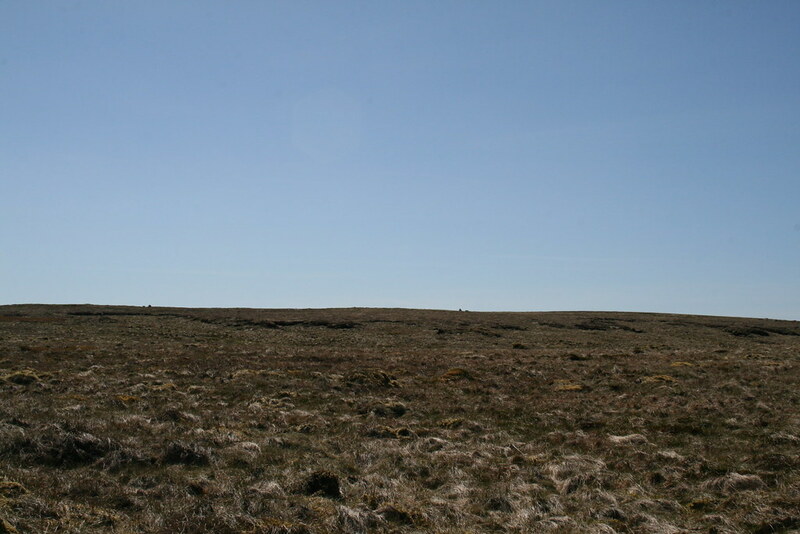 After the initial steep rise the gradient becomes more gentle as the moorland is crossed. Wild Boar Fell looked quite pointy from this angle, though in truth it is a large plateau. At a nick in the skyline a left turn took us up a nascent ridge called The Nab to the tumulus at the north east end of the plateau. From here the top is off to the west a few hundred metres. 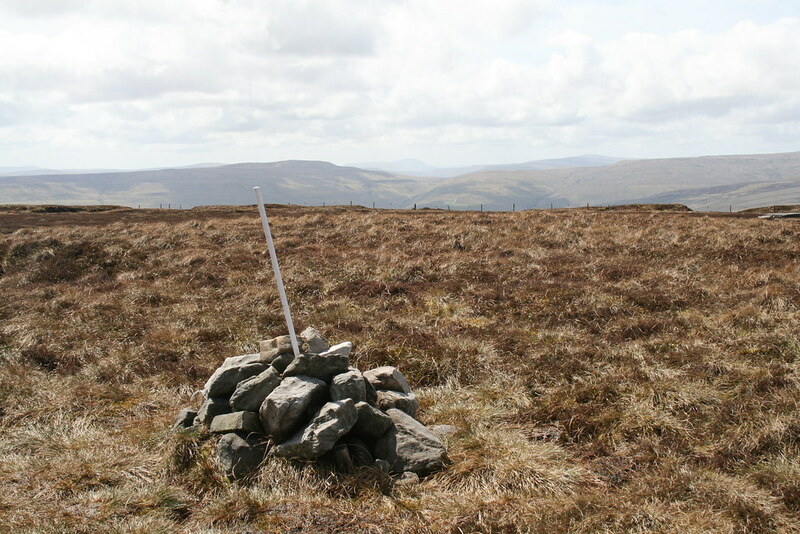 We crossed the plateau to the summit trig and shelter – no sheep here. 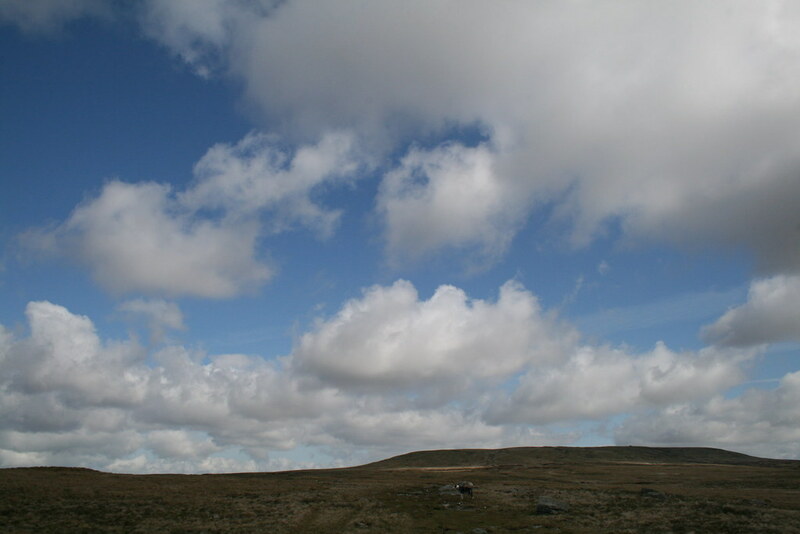 A brisk wind invited shelter by the trig. The Howgills across the way were being brushed with cloud and it looked a bit black to the south. After the brief rest we zagged back across to the east to the east top overlooking the Vale of Eden where there is a line of well made tall cairns easily visible from the valley below. Quite why they are there? Who knows. We next followed the escarpment south and then west and down to the wet col with Swarth Fell. 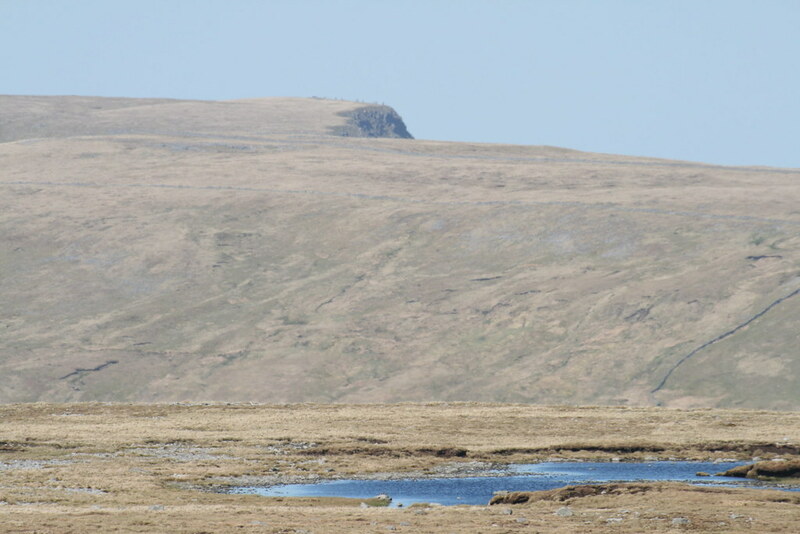 The prominence of Swarth Fell is sufficient to make it a “Hewitt” but (unlike Wild Boar Fell) not a Marilyn. 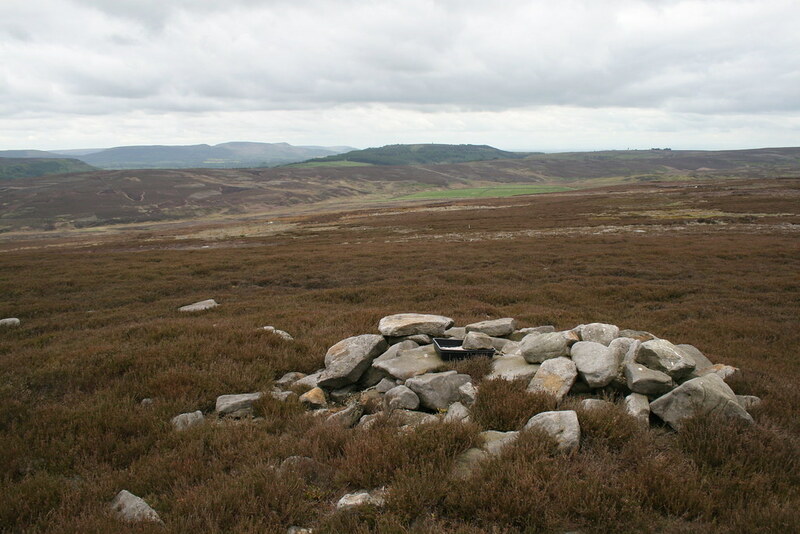 The summit is probably the cairn but there are some rocks by the county wall and also between there and the cairn which may be higher. The wind was definitely becoming unpleasant but at least it was not raining. 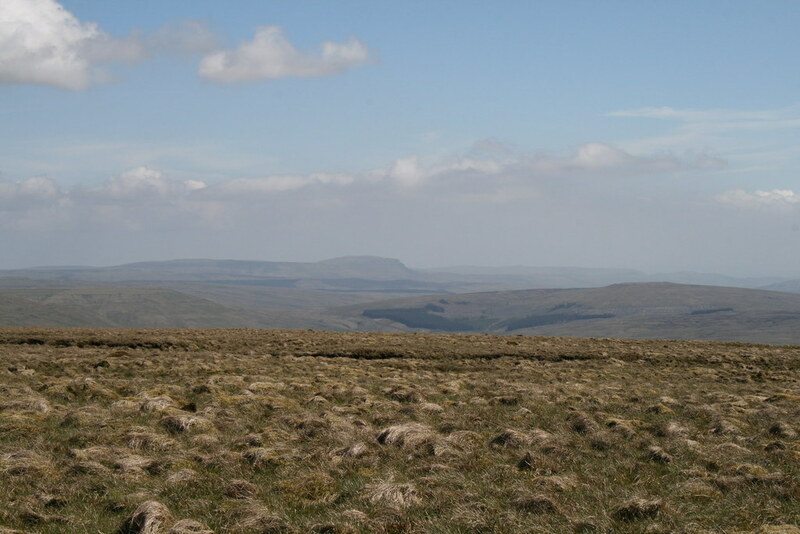 The plateau of Wild Boar Fell is well seen from here. We then wandered over the Swarth Fell Pike passing a group of four. The ground became wetter from here and the wind even stronger. 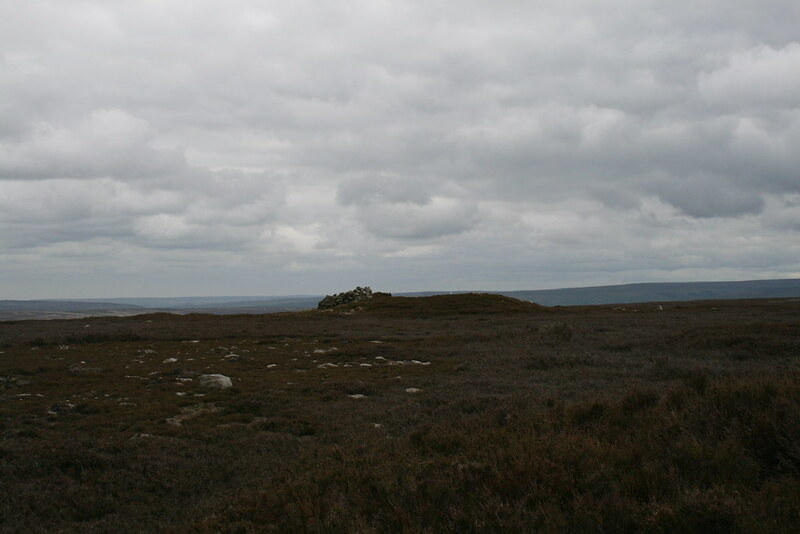 There is a large cairn on the Pike but the small rise, such as it is, is otherwise lacking in character. We followed the ridge line south for 700m and then set off east north east across wet country to Aisgill Moor Cottages and the land of sheep. From there, rather than taking the road we followed paths/bridleways parallel to the road back to the start point. Near the end we had an encounter with two black lambs who romped up to us. Jet was unsure what to do and, if he had not been on the lead, I imagine he would have taken off somewhere – the brave hound! Anyway, Jet and the lambs sniffed each other and then the lambs bounced off to find something else new to look at. Another day spent bagging a couple of Marilyns. Because of access conditions, I did not bring Jet on this occasion. As I left the house I had the definite feeling that Jet was communicating a degree of disappointment at being left behind. The first target was Hoove. The forecast for the day was somewhat better than that for Aye Gill Pike and Great Knoutberry Hill two days earlier. Hoove stands on the northern edge of the Yorkshire Dales National Park just inside the County boundary with Durham. 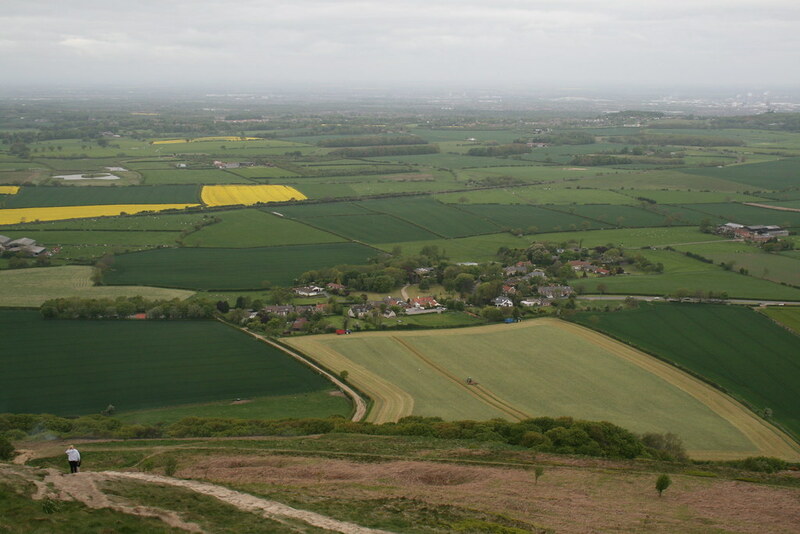 It promised expansive views, particularly to the north east. In fact the hill has little to recommend it. I found a spot on the road between Reeth and the A66 to park up. Clouds were high and broken, but the atmosphere remained hazy. A blustery wind chilled me as I made myself ready. Hoove is 554m or 1,817ft high. 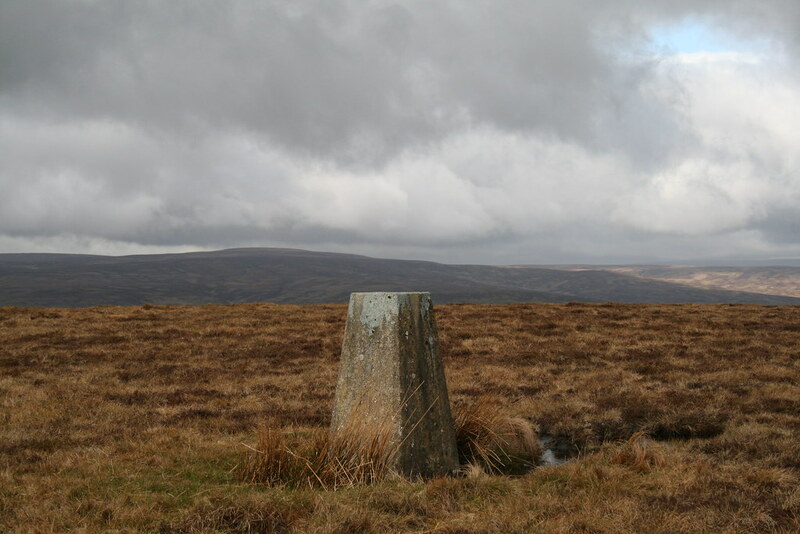 The OS shows two spot heights, one for the trig point (553m) and one about 300m to the south west of the trig point (554m). I would have about 100m of height gain from my starting point. The hill forms part of a grouse moor and a rough vehicle track ran up the side of Hurr Gill, so I made for that. The climb is not steep and at around the 520m contour point I broke off west up rough and wet ground to the summit plateau. Here, underfoot, things were sodden and it was often the case that it was necessary to jump from tussock to tussock to avoid wet feet. The trig point came into view some way off to my right as I sought out the 554m point. I stomped around the featureless ground before determining that at some point I must have been to the true point. There is no man made marker to determine where it is. I then squelched my way over to the trig point that was ringed by a small moat of standing water. Nearby there was a small shallow sinkhole which might provide a modicum of shelter from the elements. The views were indeed expansive, albeit slightly limited by the facts that the air was not clear and that standing in the middle of a large plateau is rarely the best of viewpoints. It had taken me 30 minutes to reach the top. Darlington and Middlesbrough could be seen off to the north east. 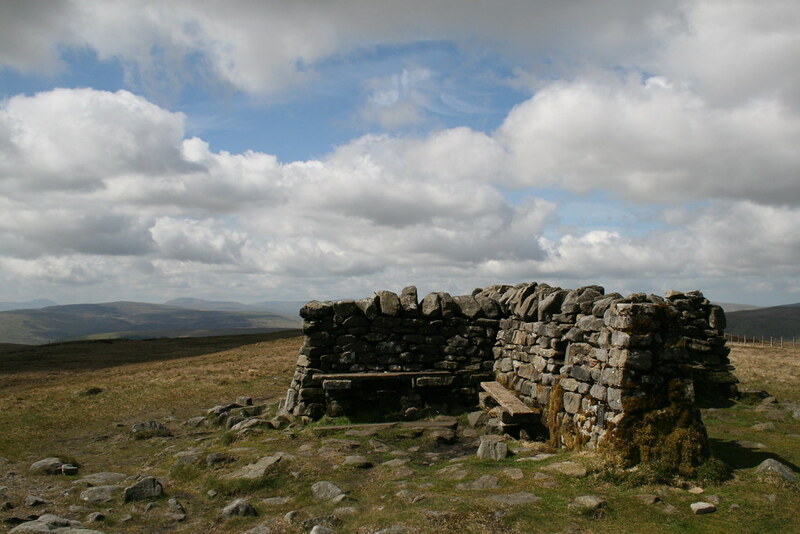 In the arc to the south and west were Rogan’s Seat, Lovely Seat, Great Shunner Fell and Nine Standards Rigg. But they too could not be seen clearly. I did not hang around and 20 minutes later I was back at the car. The next target was Rogan’s Seat. 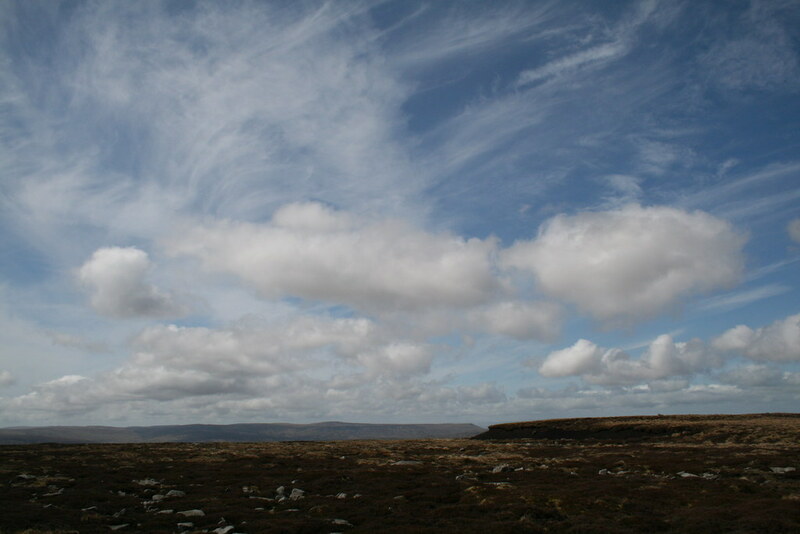 This is a rather isolated top lying to the north of Swaledale and is 672m or 2,205ft high. 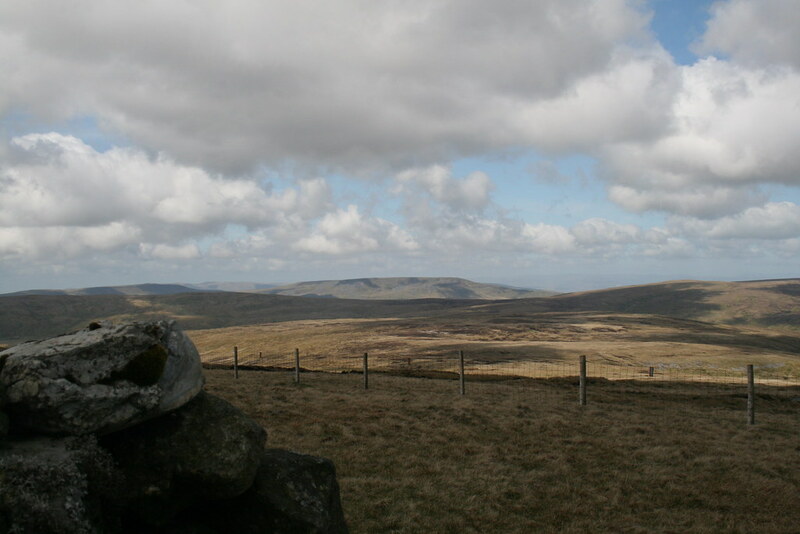 To the north of Rogan’s Seat stretch miles of desolate moorland until the A66 is reached. 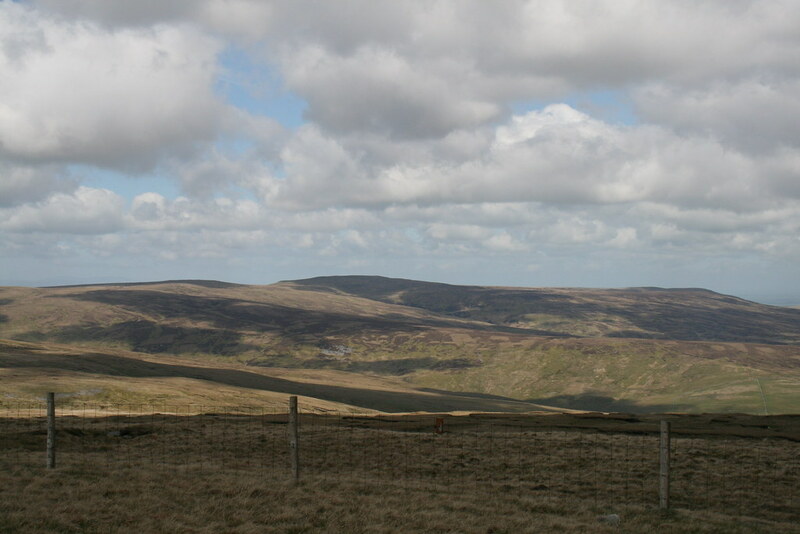 This area is breached only by the minor road that runs past the Tan Hill Inn, England’s highest pub. So usual routes up are from the south. Who or what Rogan was/is, I do not know. 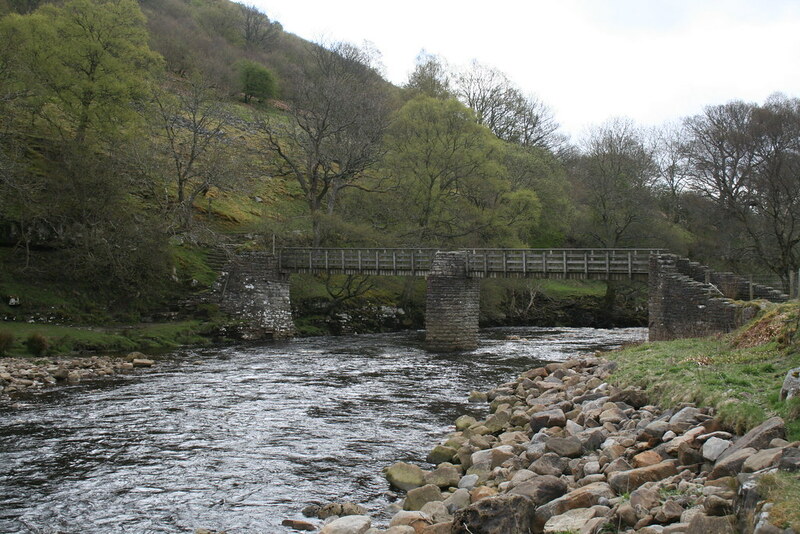 I had originally planned to start the walk up from the village of Gunnerside. But being a bank holiday weekend, I could not find a spot to park. So I went on an extra 3 miles to the village of Muker. As it happened this was probably a better place to start. 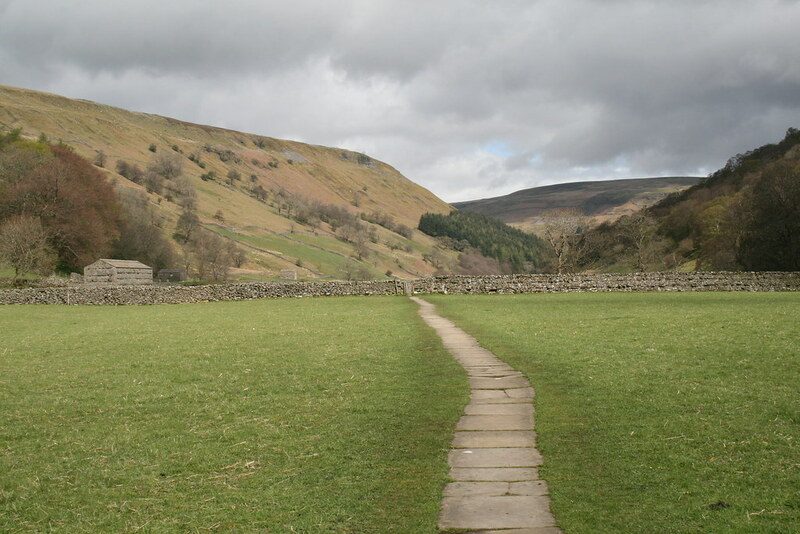 Here a path emerges from the village into meadows that lead towards the river Swale. Flagstones have been laid through the fields in order to combat erosion. Sheep and recently born lambs dotted the green of the grass. I passed through a series of stiles and reached the river where there is a bridge. Once crossed there was a delightful walk up the Dale in the direction of Keld to the north. 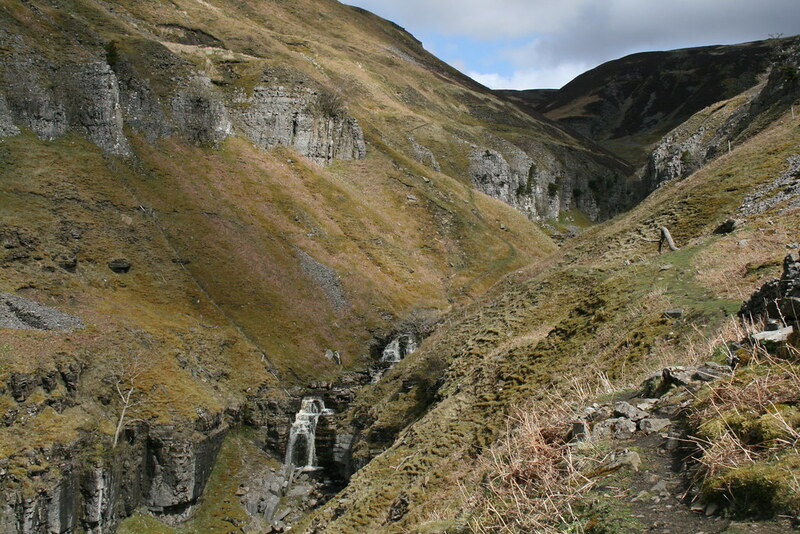 But before Keld is reached, an unmarked public footpath leaves the valley in a short sharp climb up into the cleft created by Swinner Gill. This has some pretty waterfalls. By now the amount of blue sky was greater than that covered by clouds. There was still a stiff breeze, but in the cleft it was a bit more sheltered and warm. 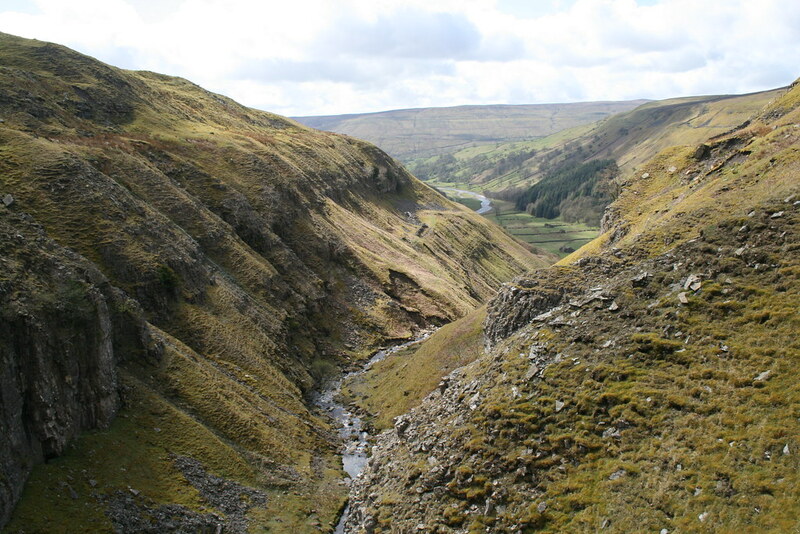 The Gill splits where Hind Hole Beck and East Grain meet. At this point there are the ruins of buildings which were used for lead mining in Victorian times. A group of four was sheltering behind the walls of the main building as I passed. The route continued up the side of East Grain, sometimes a bit wet, and eventually intersected with a gravel road. 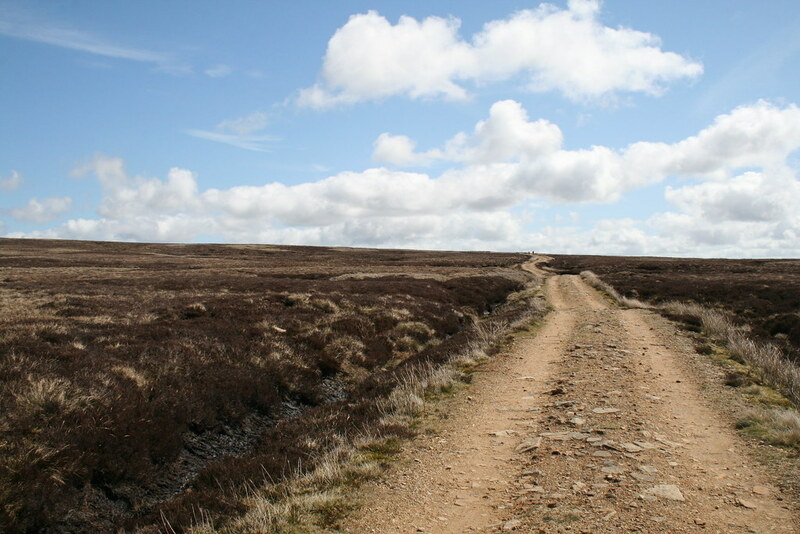 Gunnerside Moor is one of the largest shooting moors in North Yorkshire and before the introduction of the access legislation was jealously guarded by the owners. That said the road follows the route of a bridleway at this point. 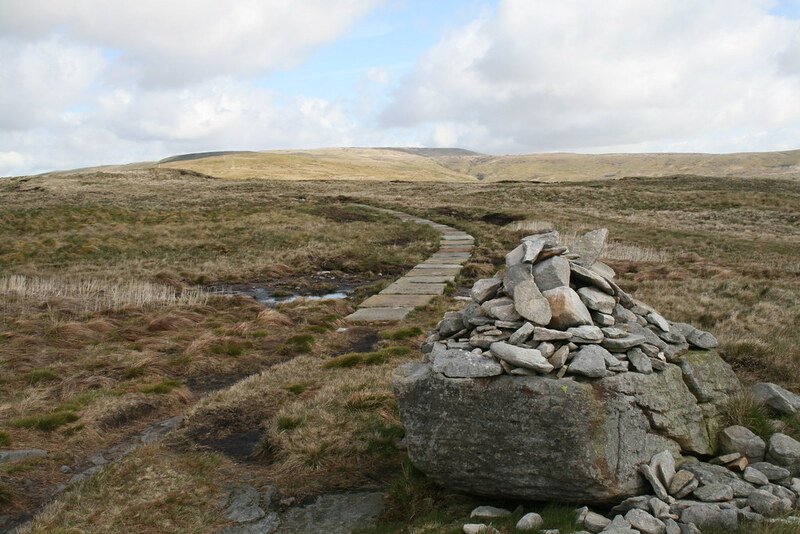 There are no public rights of way to the summit of Rogan’s Seat. But there is a “T” junction in the road and I followed the road to the north for 2km as this takes you past the summit for the final 100m of ascent. Shortly before the final rise there is a substantial wooden shooting cabin, shuttered up today. 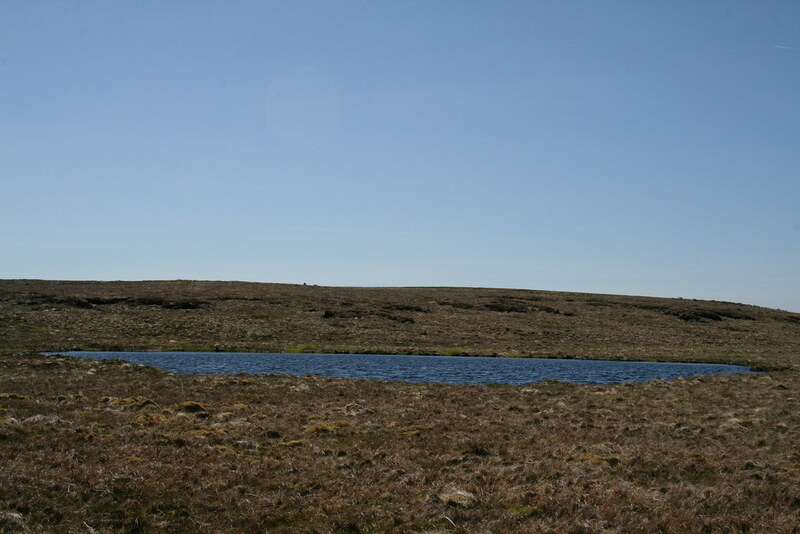 The summit is rather undistinguished, being a small pile of stones situated on a large peat hag lying 100m squelchy metres off the road. I had the summit to myself, apart from a small flock of sheep, although there had been other people on the road before the “T” junction. It is lonely country up there. It had taken me slightly less than 2 hours to reach the top. Again, as I was in the middle of a large plateau, the views were expansive but there was a lot of foreground! Great Shunner Fell and Lovely Seat were the most obvious hills but there was also an interesting angle on Ingleborough to the south west. 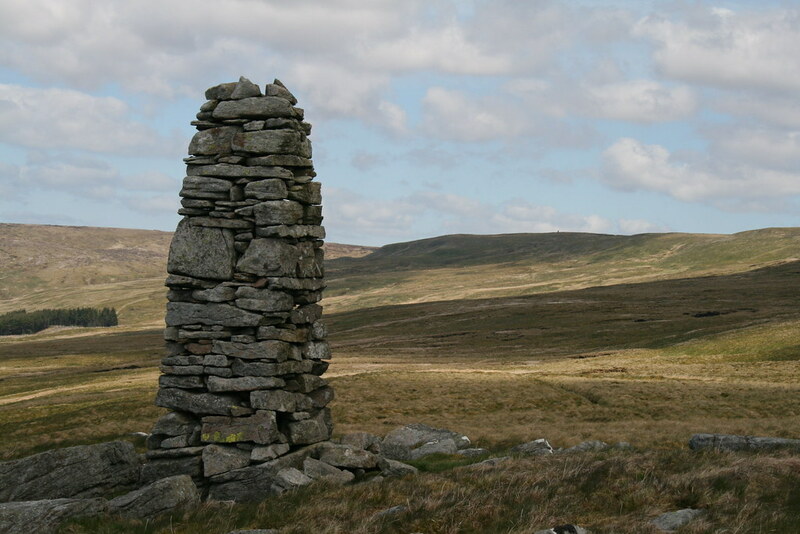 Off to the north east (and looking higher but actually 4m lower) is Water Crag, its cairn being an obvious feature on the skyline. I understand that it is the better viewpoint but I could not be bothered to make my way over the hags and through the bogs to get there. At the start of the day I had had a vague idea of also tackling Great Shunner Fell. But time was passing on and I thought I would be tired enough by the time I got back to the car to give it a miss. 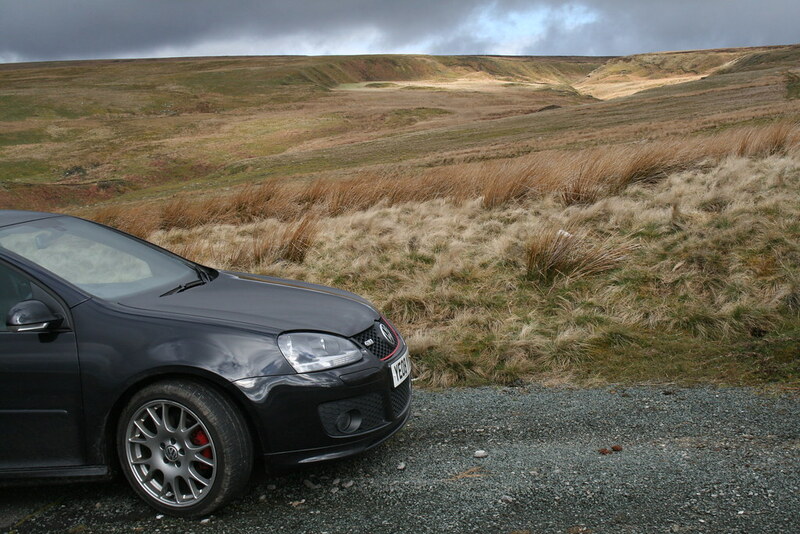 So rather than returning the same way I decided to make a circuit of the shooters’ road via Gunnerside. I did pass one other walker on the 2km trek back to the “T” junction. He pounded by, walking sticks clicking, acknowledging me with a breathless “hello”. Back on the main track, which also forms a part of the Coast to Coast trail, I turned east and then south down into the valley of Gunnerside Gill. 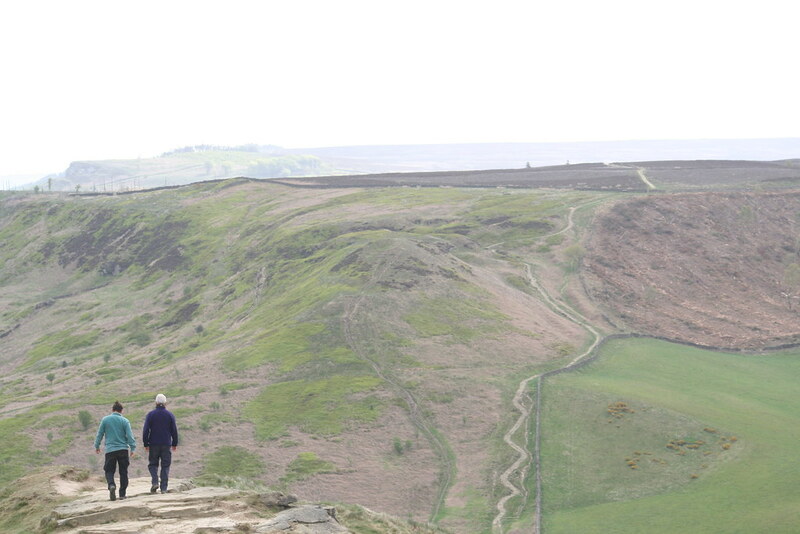 Here there is more industrial heritage in the form of old mines, spoil heaps and ruins. 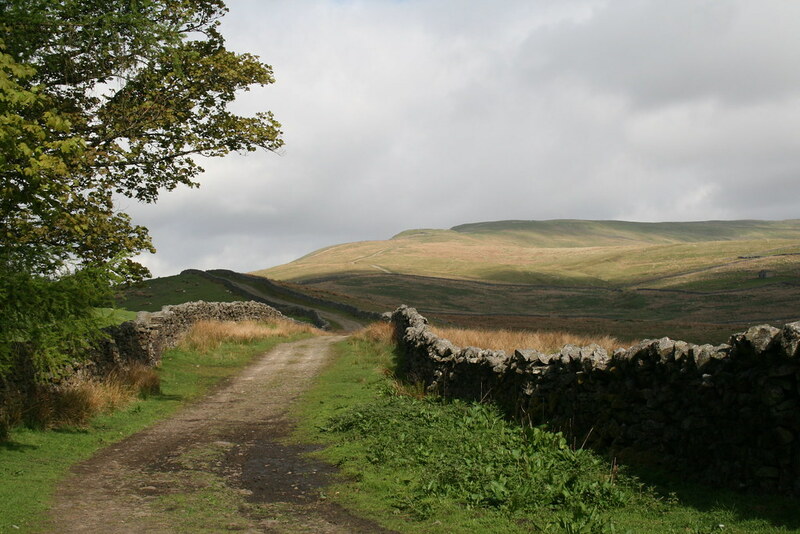 The road descends gently overlooking the Gill and typical Dales’ stone barns on the other side of the valley. 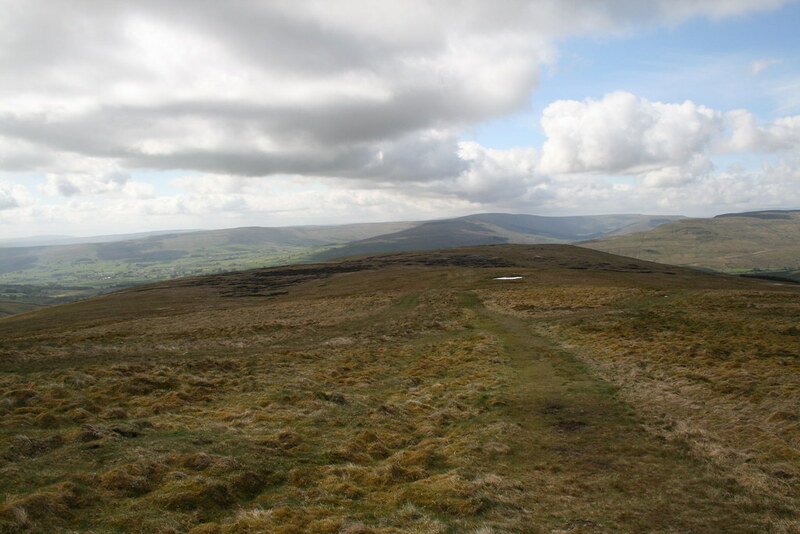 Above Gunnerside the road then turned south west and joined with a metalled public road which I followed to Calvert House where a footpath gradually descended towards the river. 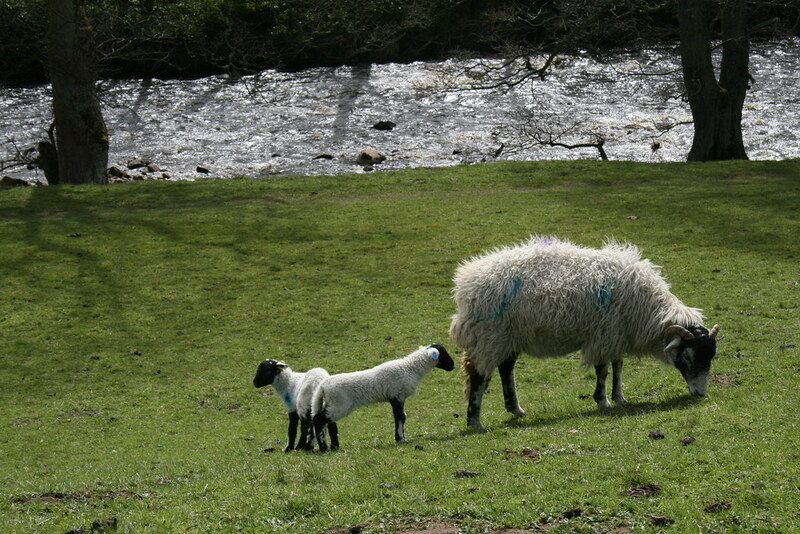 Here, again, I was surrounded by rather small lambs (the ones at home being a couple of months older). The river was too deep after rain the day before to ford so I returned via a short diversion to the bridge I had used earlier in the day and ambled through the meadows back to Muker. All in all very pleasant. Back in the village there was a lot of activity. I avoided the temptation of stopping for a cream tea in the café to go home.